I certainly can't speak specifically for Edible Arrangements, but I'm willing to wager that whatever chocolate they're using is NOT just Nestle's Toll House chocolate chips, but premium chocolate. I'll bet the fruits are carefully selected, as well. This is kind of like why you can never get that "steakhouse" flavor out of a steak cooked at home, no matter how good a steak you get from the supermarket, because the steakhouses are usually buying a grade of steak better than your supermarket is (and those ultra-hot broilers don't hurt, either). 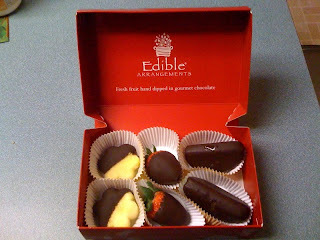 Dan - You're right, I never thought about the expense of the chocolate covered fruits at Godiva - yikes!!! That was the most delicious bouquet EVER!!!!!!!!!!!! hey Nakiya..this is awesome getting a free box for edible arragements..and am so glad that you liked the arrangement to have mentioned it on your post! SE- Yea, I was super psyched to get this for free!!! What a cool coupon, right? And seriously, your fruit arrangement was AWESOME!